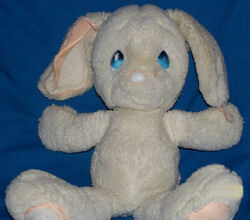 I’m looking for a Snowball 1985 Precious Moments by Applause plush white rabbit. It has pink silk detailing (in the inside of ears and bottom of feet) and has tear drop shaped eyes. I received one when I was a baby. I am 26 years old now, and still sleep with her every night. My son loves to sleep with her now, and he is about to have his first birthday. I would love to get him his own one. Thanks, Peggy. I sent the link to both of them. I have the 1985 Applause Precious Moments white/pink rabbit. It is in excellent condition, it has the locket, tush tag, and the hang tag still attached. No stains, wear, or tears. I would be willing to sell.